Tritheism says there are three gods. But Scripture says there is only one God. Unitarianism says there is only one God in one Person, namely the Father alone. It denies the Trinity and deity of Christ, and makes the Spirit an impersonal force. Unitarianism is held to by Jehovah’s Witnesses and other cults, the Unitarian Church, and many Liberals. Sabellianism says that God appears in three different ways, or roles. This is also known as Modalism or Monarchianism. Under this view there are problems with Jesus “praying to himself” in the Garden prior to his arrest and crucifixion. Christomonism places the Son at the head of the Holy Three, ignoring the orthodox eternal truth of their equality. This view was held to some degree by Karl Barth. Eunomianism says that the Father created the Son, and the Son created the Spirit. This denies the eternal natures of both the Son and the Holy Spirit. Mormonism says that the Father is Elohim and the Son is Jehovah, but neither are eternal, as both were at one time human. This fits with the Mormon view that all believers eventually attain divine status. Temporal Generationism rejects the doctrine of Eternal Generation, saying that Jesus is only the Son by virtue of his Earthly birth, although he is God. Dualism says there are two gods, usually God and Satan, but occasionally God and Jesus, with the Spirit having no divine quality. Quadtheism or Quadinity says that there are four gods or four persons in God. Some say that Roman Catholicism sits on the edge of quadtheism by including Mary in the Godhead, although this is difficult to maintain if one understands the Catholic view of Mary. Some cults include their leaders in the Godhead, but clearly there is nothing biblical in this. So, let’s try to work through the Trinitarian doctrine, using Unitarianism as a benchmark, as it’s the most prevalent current counter-theory. Unitarianism simply states there is one God, and highlights the incidences where the physical Jesus speaks of God as his Father, and appears to have an independent will, as in his prayer in the Garden of Gethsemane. The incarnation of Christ is dealt with in terms of the divine Logos, or Word of God, existent from time immemorial, being given physical form in the womb of Mary. The argument goes that although the Word is eternal, the Son is not, and is therefore not equal to God. Indeed, nothing could be equal to God as God is One. Trinitarian doctrine has it (as we’ve seen above) that God is one essence, subsisting in three persons, the Father, Son and Holy Spirit. All are equal in nature and essence, although there is a revealed hierarchy in the Trinity as far as Earthly actions are concerned, with the Father sending the son, and the Father and the Son sending the Holy Spirit. So, how did the man Jesus become God? Firstly, Logos is a philosophical term first applied by Heraclitus (ca. 535–475 BC), who used the term for a principle of order and knowledge, and Philo (c. 20 BC – AD 50) who adopted the term into Jewish philosophy, obviously prior to the birth of Jesus. In Christian thought the Logos applied to “wisdom”, personified in Jesus. In fact, the word “philosophy” comes from the Greek “to love wisdom” (philo-sophia). Secondly, the personification of Wisdom was a common literary device, whereby the attribute was so strongly identified as to merit personhood in it’s own right. Jesus spoke of Wisdom and her words in Luke 11:49, but Matthew records Jesus speaking strikingly similar words in the first person in Matt 23:34, substituting ‘I’ for ‘the Wisdom (Sophia) of God’, which makes the point implicitly. In the Epistles, the Apostle Paul provided the most explicit identification, calling Jesus “the wisdom of God” (1Co. 1:24). Also, see Hebrews 1:3 where Christ is said to be ‘the radiance of God’s glory.’ This reference, and his identification as “the image of the invisible God” in Colossians 1:15 comes from a text where Wisdom is said to be “a reflection (or “radiance”) of the eternal light, untarnished mirror of God’s active power, and image of his goodness” (Wis. 7:26). 1 Corinthians 8:6 speaks of Christ as the one through whom all things came, providing a parallel to Wisdom as the one God created “by” (Pro. 3:19). 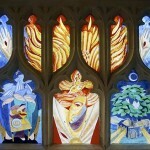 Indeed, references to Christ’s involvement in creation throughout the New Testament can be traced back into Wisdom texts in both the Old Testament and other Jewish literature. So, in Trinitarianism, the Incarnation of Jesus seems to have at its root the personification of an abstract concept, in line with the most popular Unitarian view. However, Unitarians disconnect the Incarnation from the eternity of the Logos, as they stress that Logos is an abstract term, and though the “Word became flesh” this more readily translates as “God begat his Wisdom, knowledge and overall plan in the form of a man”. Thus, in many forms of Unitarianism the pre-existent Logos of God became Christ the Man. 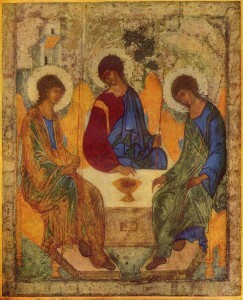 In Trinitarianism the Logos takes on a greater degree of “personhood”, being capable of independent thought and action, continued in the physical form of Jesus, so the orthodox view is of an eternal, single nature plus a new human nature, both existing in the person of Jesus, where the Unitarian view is of the thoughts and plans of God being given human form at some point in history. It’s important to point out that the concept of a person of the Trinity becoming a man is called “incarnation”, where anything else might be called “creation”. The Nicene Creed has Jesus as “Incarnate from the Virgin Mary”. 26 But when the Helper comes, whom I will send to you from the Father, the Spirit of truth, who proceeds from the Father, he will bear witness about me. Ananias, how is it that Satan has so filled your heart that you have lied to the Holy Spirit and have kept for yourself some of the money you received for the land? Didn’t it belong to you before it was sold? And after it was sold, wasn’t the money at your disposal? What made you think of doing such a thing? You have not lied just to human beings but to God. The Nicene Creed took the above clues, along with many others, to protect the biblical statements against perceived heresy, as we have seen. It might help to look at the context: voting at the First Council of Nicea substantially went against the non-Trinitarian view espoused by Arius, and he was temporarily banished as a result. Interestingly, Constantine, who oversaw this council, later converted to Arius’ views and eventually died rejecting the Trinity. As was said earlier, the understanding we have of the Trinity is based not so much on explicit bible verses, but on implicit clues and the conclusions drawn from them. In many ways the early Church took a simpler view of theology than some might today, and was happier to accept that some apparent logical contradictions might be attributed to “mystery” or “paradox”. It seems that today we have lost this innocence, and developed a will to re-interpret all that’s been handed down over 2,000 years in favour of a more “rational” approach; a form of “secularisation” perhaps. For my part I remain a Trinitarian. However you define the Logos it was with God eternally and as something that emanated entirely from God, is divine. It is that divine nature which took on flesh, along with a human nature, in the person of Jesus. Jesus is the Son of God, conceived by the Holy Spirit and born of a virgin, so bearing in mind his fatherhood we cannot deny his divinity. That divinity is all of the one God, the Father, so either we now have two Gods, or Jesus is somehow a part of that one God. You decide.